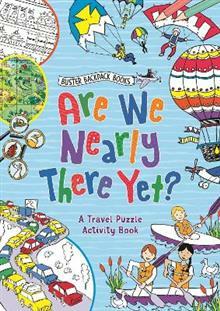 The perfect travel companion for any child, this is a book to get kids excited about their journey and will make sure their holiday memories never fade. The perfect travel companion for any child, this is a book to get kids excited about their journey and will make sure their holiday memories never fade. It is packed with cool puzzles and games to play on the way, and includes themed spreads to help them remember and cherish every part of their time. There is space to stick in memorabilia and photos, boxes to tick and fill in, and loads of fun things to colour - this doodle scrapbook will make any journey fly by! Alex Paterson's work has been published by Orchard, Orion, Random House, OUP, C ollins and Wayland. He works in pen and inks and watercolour paper but also digital. Jessie Eckel completed an art foundation course in Nottingham and won the Ida Berry Young Artist of the Year Award at the end of the course, before moving to London to take a First C lass degree in Illustration. Her degree course was so successful that she received immediate commissions from prestigious organisations like Greenpeace, Habitat and Wagamama. She now works full time as an illustrator, producing artwork for stationery items homewares and publishing. She is the illustrator of Doodle Dolls and has illustrated a series of colouring books for Buster.